Maclaren Products has been in the Gas Controls business for over 50 years. As well as manufacturing our own range of Domestic Gas Control Valves, we complement this by supplying a further range of control valves for Gas, Oil and Pneumatic applications. We also supply Baso Gas Products to the UK market. In addition to our standard and bespoke pilot burner range, we currently supply electrodes and thermocouples as accessories. Maclaren Products have recently become Scottish agents for Caledonian Control Technology Ltd, who design and manufacture fully approved commercial kitchen and gas safety controls to BS6173. 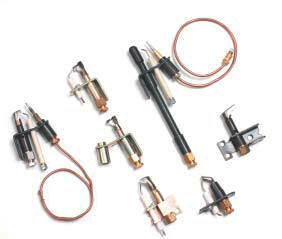 We manufacture our ACS range of Rod Thermostats. Rod Thermostats equivalents for Proscon, White Rogers and Honeywell can be manufactured on request. Maclaren Products are approved to BS EN ISO 2001:2007 and work within the scope of the Council Directive 90/396/EEC European Gas Appliance Directive, Annex II, section 3, EC Declaration of Conformity to type (Guarantee of Production Quality).